I have this book and its sequel on audio. I am hoping to get to it soon! I'll be interested to hear what you think when you get to this one. It's really long - did you know? I saw the audio book at work and it's 16 CDs! Is this a spinoff of _To Say Nothing of the Dog_? It's set in the same Oxford time-travel universe, but I read To Say Nothing of the Dog so long ago, I wasn't able to remember if any of the characters were the same. I enjoyed that one much more than this one, though. 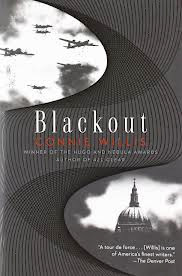 I felt much the same about Blackout, but I went ahead and read All Clear because I was hoping it would resolve some of the problems I had with Blackout. Since you're saving yourself the trouble anyway, I'll just tell you: It didn't. It had the exact same strengths and weaknesses as Blackout. I'm glad I'm not alone in this. Thanks for letting me know about the second one - I feel better about bailing now!